Perry, Okla., July 5, 2017 –Subsite® Electronics, a Charles Machine Works Company, has announced the acquisition of the assets of R.S. Technical Services, Inc., an innovator in the design and manufacture of closed-circuit television remote inspection and monitoring cameras. The deal adds proven camera inspection capabilities to Subsite’s robust line of Underground Awareness™ solutions. Perry, Okla., July 5, 2017 –Subsite® Electronics, a Charles Machine Works Company, has announced the acquisition of the assets of R.S. Technical Services, Inc. (RST), an innovator in the design and manufacture of closed-circuit television remote inspection and monitoring cameras. The deal adds proven camera inspection capabilities to Subsite’s robust line of Underground Awareness™ solutions. RST camera systems feature single conductor technology, which accommodates all power feed and return functions in a single cable. 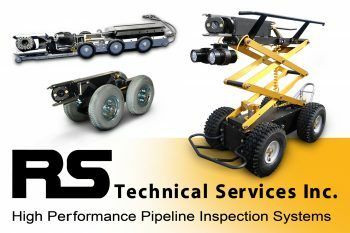 Past RST innovations include the first true pan-tilt camera with tracking lights from a U.S. manufacturer, the first steerable storm drain tractor or large pipeline tractor, the first single conductor laser and sonar profiling systems, and many more. “Their culture of innovation and customer service is a perfect fit with our own drive to bring customer-driven innovative solutions to the underground construction industry,” Johnson says. Operations will continue in Petaluma, CA, and Mt. Sterling, KY, and RST products will be continue to be available through the current RST dealer network. For more information on RST products, visit www.rstechserv.com. You can also contact RST at customerservice@rstechserv.com or 800-767-1974. For more information on Subsite® Electronics, visit www.subsite.com or any of our social media channels – Facebook, Flickr, Twitter, Google+, LinkedIn and YouTube. You can contact us at info@subsite.com or 800-846-2713. About R.S. Technical Services, Inc.
For more than thirty years, R.S. Technical Services, Inc. has been an innovative, driving force in the design and manufacture of closed-circuit television remote inspection and monitoring cameras and accessories. Our primary customers work in water and wastewater collection and conveyance systems, mainly pipelines too small to allow man entry. Our equipment is built around single conductor technology, which accommodates all power feed and return functions in a single cable to make our equipment less bulky, easier to control and far safer to use than that built with multi-conductor technology.